When I said wipe the inside jars, I meant BEFORE PCing, before even putting the lid on, and only with "no-pour" dishes. Again, the biggest way to avoid excess water in them is to let them cool COMPLETELY before putting the lids on, also when heating the agar mixture, get it lightly boiling for a few seconds, and use a wisk to stir it well but don't let it set too long without stirring, remove from the heat and POUR IMMEDIATELY, that allows some steam to escape. If your following the recipe/procedure right you shouldn't get much excess moisture. Here is a link to my agar tek, really it's not my tek, I just added egg coloring to it and made the write up kind of as a joke, but the tek is what I use still, excuse my bad attempts at humor in thread. Hey here's a vid showing the exact method I use in my thread(link). EDIT-it's not my vid, I found it on YT. Edited by Billcoz, 12 April 2019 - 12:35 PM. Re the not-so-SAB, I'll inquire about that - effectiveness and construction. So, what I think I will do is let it cool, much MUCH MUCH longer with the lid OFF. I believe this is where my biggest mistake was made, besides my excess MS innoculation. I let them cool until the container was no longer holding warmth in the refridgerator with the lid on turned upside down... Obviously excitedly trying to cut corners was the true mistake here. The not so sab, easy to mess up. Make work great, may give you a "Spornado". A couple things, not all agar is created equal. I had to use a lot more flake agar that powdered to get the same result. I still use 12g per 500ml rather that the 10g you'll see often reccomended. No pour I leave open until cool, wipe if neccesary, prior to the pc run. Then leave in the PC til cool. Theory is slower cooling, less condensation. Nothing to do with condensation, but try to avoid solids if you adding odd extras. Boil your water, with nutrients and etc, strain it and add water if neccesary to bring back to recipe volume. Good point JKDeth, the common theory for getting less condensation after PCing is to let them cool in the PC slowly. Also, after mixing/boiling the agar, I pour it from the saucepan into a measuring cup and if needed I bring it back up to half a cup. I make 6-8 of those mini tupperwares or 1/4 pint jars, or 3-4 1/2 pints. I use 2.5 grams agar(flakes), 1-1.5 grams potato flakes, one drop of honey, and a tiny bit over half a cup of water. That should boil down to exactly half a cup when done or I add water if it's less than half a cup. Once it looks completely dissolved I let it boil WHILE STIRRING for 30-60 seconds and immediately pour it into a measuring cup, make sure it's 1/2 cup, then pour(or scoop) it into the dishes. Let them cool completely, put folded paper towels on, then foil. PC for 40-45 min. Let em cool overnight in the PC. 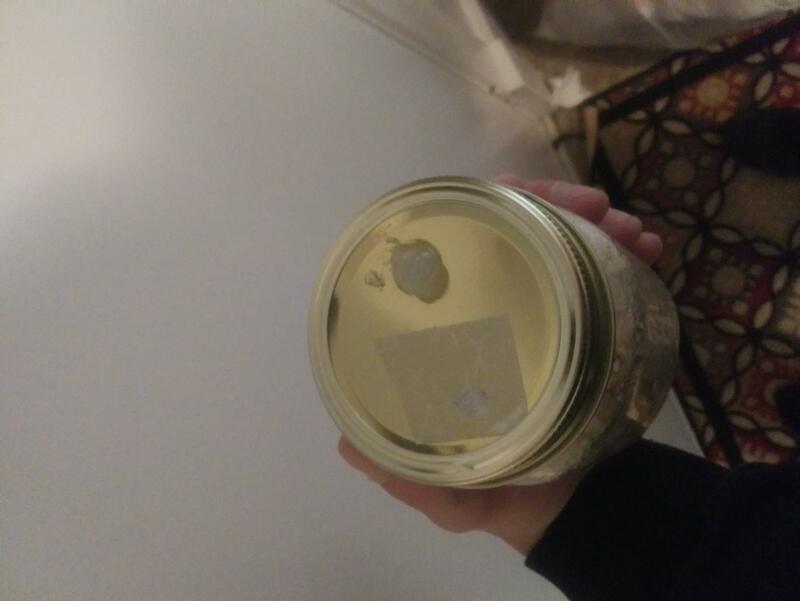 So im not giving up on the agar, but I am going to start some multi spore grain jars while I fail and repeat with the agar. I pressure cooked 2lbs of long grain brown rice, with 6.5 cups of water. My pint jars with SHIP and micro pore were prepared several days prior. I smoked some bho and let the pressure equalize. 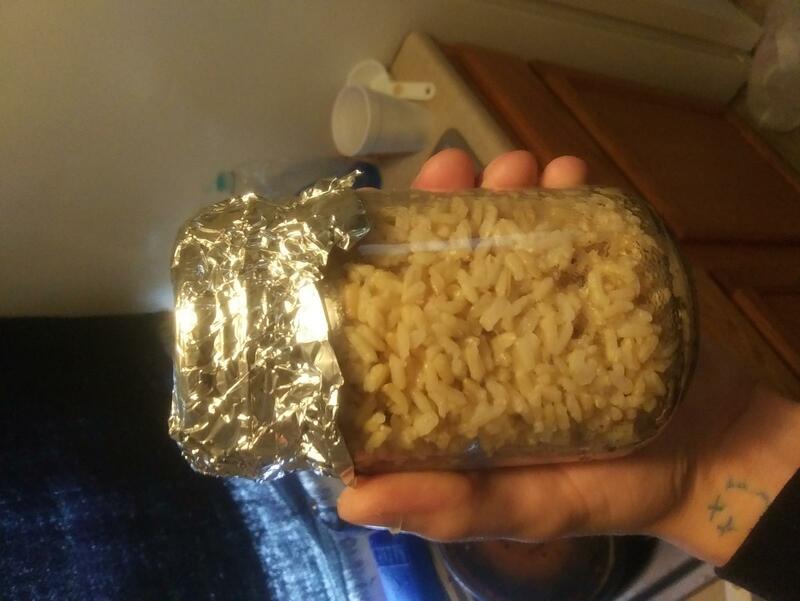 I took the lid off of the pressure cooker, and spooned the rice into my jars. I then covered the lids with folded paper towel, to keep moisture away from the micro pore. 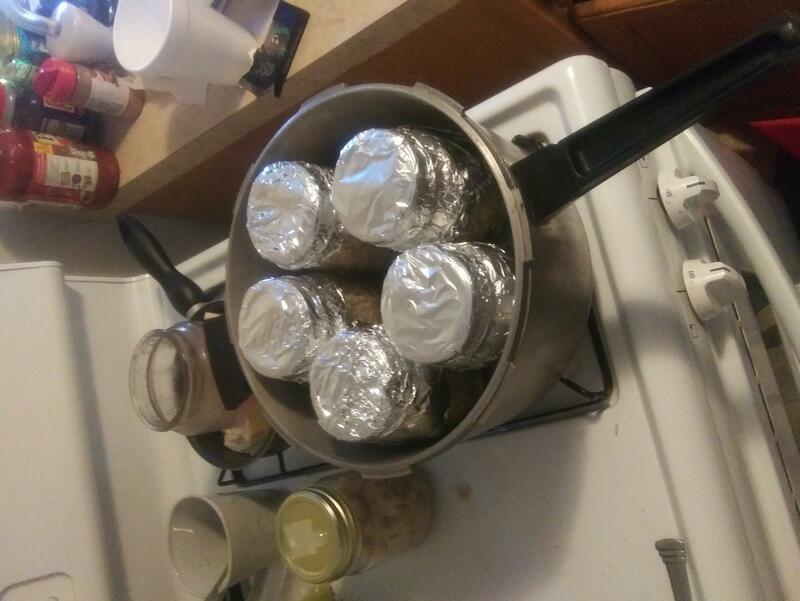 I then place a piece of tin foil on the lid of each jar. I placed the jars in the pressure cooker for 60 minutes at 15psi. Letting them cool now (in the pc as I will do with agar in the future) and I will innoculate tomorrow. Tried to make a more informative well put together post, so you guys were properly informed of my method. I kindof neglected detail in my agar prep explanation. Edited by Dimitri2teachme, 13 April 2019 - 01:06 PM. Interesting. are you making 'grain jars' or is this a mod of PF tech? Rice makes for a really sticky grain. Lots of air space between the kernels and looks like a good hydration level. That was my thought, very starchy sticky mess. Those jars look pretty good though. Good trial though. If ever get started on it, I was planned an easy tek similar. I was extremely worried about the starch, but my wife actually pulled some leftover rice out of the fridge. She said "look, this was sticky two days ago, the starches will harden a little more with time and lose some of the stickyness" and sure enough, if the brown rice is of any resemblance to what's in the fridge, the starch will slowly not become an issue. I just should not shake the jars. I shook one jar and the rice shrunk by at least 50% and i cried a little..... Now theres a rice ball in one jar... Whatever ill still noc it up too haha. Maybe use it to test that starch theory, and see if the rice ball will bust up tomorrow. Edited by Dimitri2teachme, 13 April 2019 - 04:22 PM. I am making grain jars. Cooked the rice according to the pressure cooker recipe for the 9er tek on shroomery. And sterilization methods from the 9er tek here on mycotopia. Wish there was a way to update the topia 9er tek to have the pressure cooker recipe. I'm going to play with it a bit. More of a fine tune than an absolute method. I'll start a new thread in a couple weeks on it. I will be there viewing the thread! If you've got time and rice to play with try letting it cool completely and rinsing the starch. My wife insisted it would not pick up more water, but I was unsure of this so I did not risk it. Edited by Dimitri2teachme, 13 April 2019 - 05:41 PM. That's the funny thing about, few people can cook it and not end up overcooked and sticky. Now not really a big deal if you're eating it. I know a few tricks cooking rice, not big secrets, and maybe unneccesary. But one, it should be rinsed before cooking, cold water rinsed, soaked 30 mintues, rinsed again. Not all rice will need much rinsing, easy to judge by the clarity or the rinse, rinse till the water is clear. 30 minute soak after it rinsed clear. Then for loose non sticky grains, cook it like pasta in a lot of water, til al dente. Drain and rinse. That knowledge comes from cooking, not myco. Might be totally unneccesary for spawn. I've done no prep rice for myco purposes that colonized fine, just measured rice and water straight into the jar, in the PC for 90 minutes. It was starchy and slow to colonize and ultimately failed, but I can't truly pinpoint the cause. I have suspicions that the inoculant was the actual cause. Copy and paste the part that needs to be added here on this thread, I will move/update it to ours. Oh and if you the link for the 9er tek from here that would be helpful too. "Here's a convenient recipe. It makes a little more than 7 pint jars. For many pressure cookers this is the best batch size. The excess is just enough for a tasty treat. Use a whole 2 lb. bag brown rice (Lundberg's nutrifarmed is great.) with 6.5 cups water in a big pan. Be sure to turn the heat way down (almost off) for simmering. If it scorches it won't work as well. You may want to experiment with additives. Several tablespoons of flax seed meal (health food stores) is a favorite. Delicious and nutritious for us and the mushrooms." That is the recipe I referred to. Just convenient. The recipe does not include that, as soon as the top jiggles on the pressure cooker, it is done cooking. This was in my pressure cooker manual, in a list of recipes. But I know brown rice needs cooked a little longer, so I let the top jiggle for 2-3 minutes. I will rinse and soak on my next batch, as I believe that sounds like the solution to my starch worries plaguing my brains. I hope it turned out well, it's definately not scorched. I was correct to add the extra time. The starch has kindof transferred to the glass, and the rice is more easy to manipulate. Ive shaken the shrunken "test jar" and when smacking the bottom of the jar, the rice expanded from a rice ball, back to the size of the jar, after cooling for a good 4 hours. I ended up taking the jars out of the pc early to test something, with grain (havent tried agar again just yet). I let one jar cool in the fridge one in my closet. No noticeable difference in condensation between cooling times with rice. But the difference in cooling times might not have been great enough... Thoughts? Here is the link to the 9er tek on topia. Believe its a little out dated but I'm am old soul. Edited by Dimitri2teachme, 13 April 2019 - 10:52 PM. So are you fruiting these in-vitro Dimitri? Nope, I believe I'm ready for the bulk method. I never did like the idea of cakes on perlite. Going to be doing a small monotub for my first trial though, in a pretzel bin. Its diameter is about half the width of a 25 qt tub, so i will be using approx 3 pints spawn to 3 pints coir (might add verm cant decide). This should make roughly a 3 inch depth. I will make filter holes toward the top (3) and toward the middle (3) about a half inch wide. Mist when needed. Edited by Dimitri2teachme, 14 April 2019 - 11:55 AM.